I love love love when couples give me enough time play around with their invites. Thank you Mara & Brett! 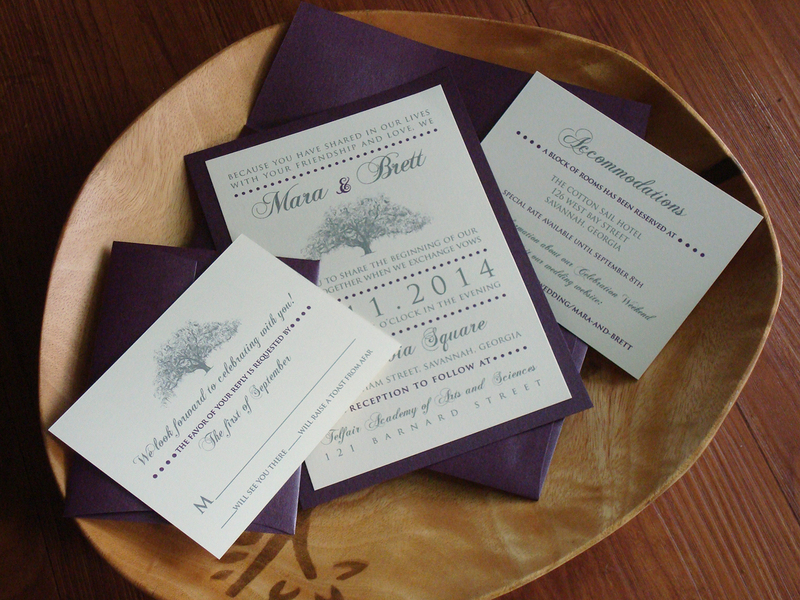 We added a deep purple backing board to the invite and coordinating envelopes. They have just the right amount of shimmer to give their guests an idea of what’s ahead. I can’t wait to see how the rest of this event comes together! For a peek at more of my wedding goodies, skip on over to The Ink Lab. 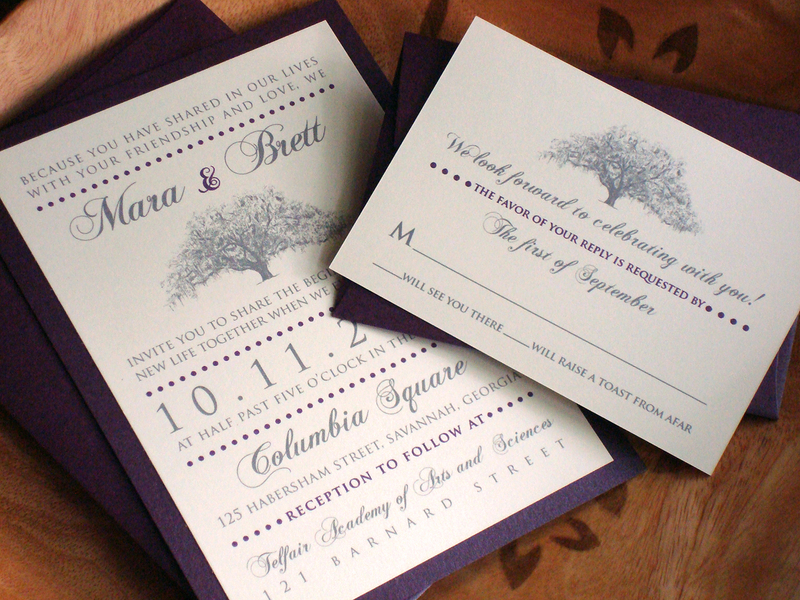 New Savannah Themed Wedding Invitations! 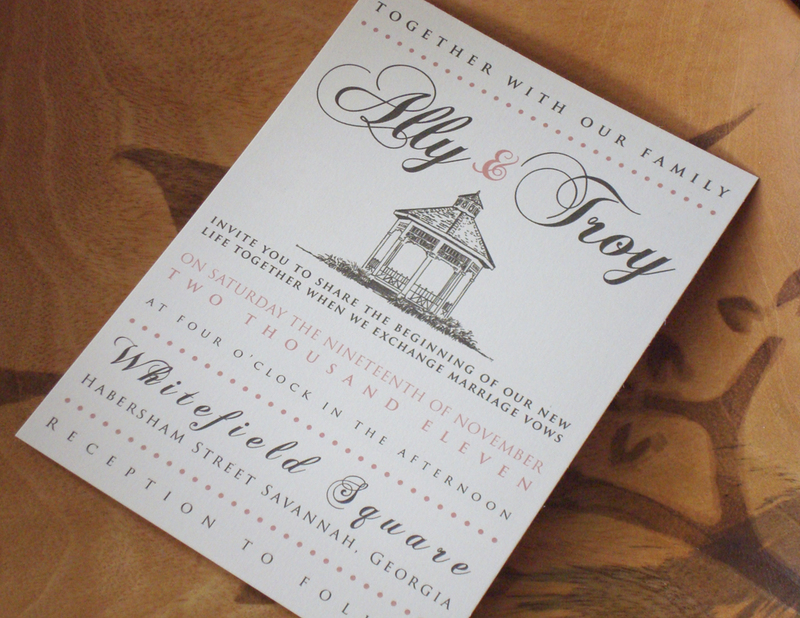 Forsyth Park Fountain, Whitefield Square Gazebo and Candler Live Oak themed wedding invitations are finally here! Thanks to all of the sweet Low Country brides that got me motivated to build on my wedding collection. It’s been a true pleasure working with each and every one of you, and I can’t wait to see wedding pictures! Having a Tree Theme at your wedding? 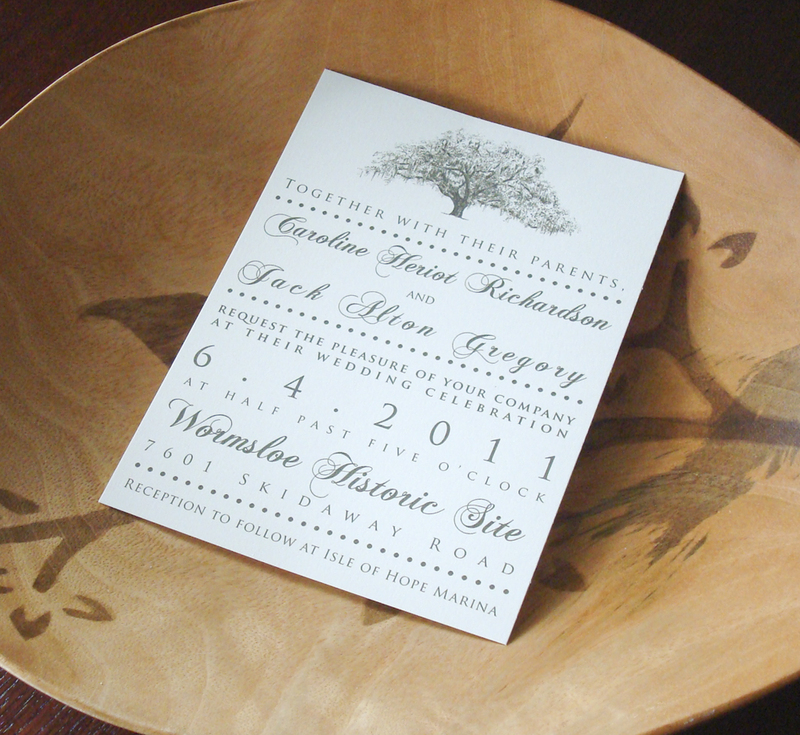 Be sure to check out my guestbook alternative, the Savannah Live Oak Thumbprint Tree. If you’re planning a Savannah Destination wedding, or have lots of out-of-town guests, the Fountain invites coordinate nicely with Savannah Wedding Welcome Bags. 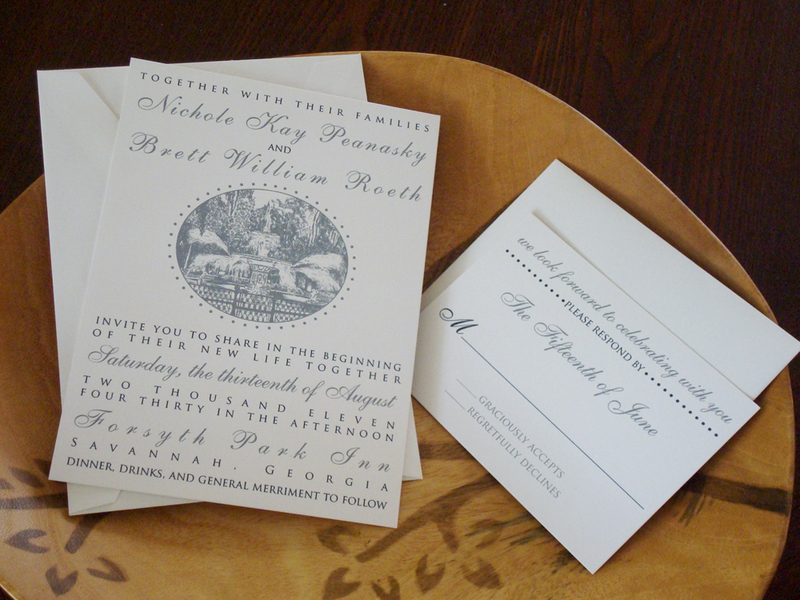 Colors and wording can be tailored to match your wedding on all three designs. Stay up to date with the wedding collection here. Hope you all have a safe and lovely Memorial Day Weekend! 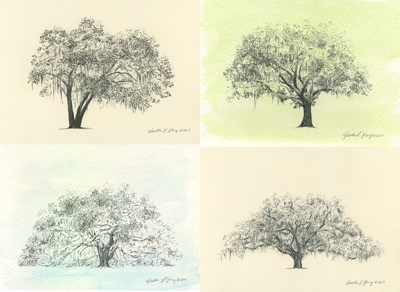 Savannah Live Oak Tree Prints are here! 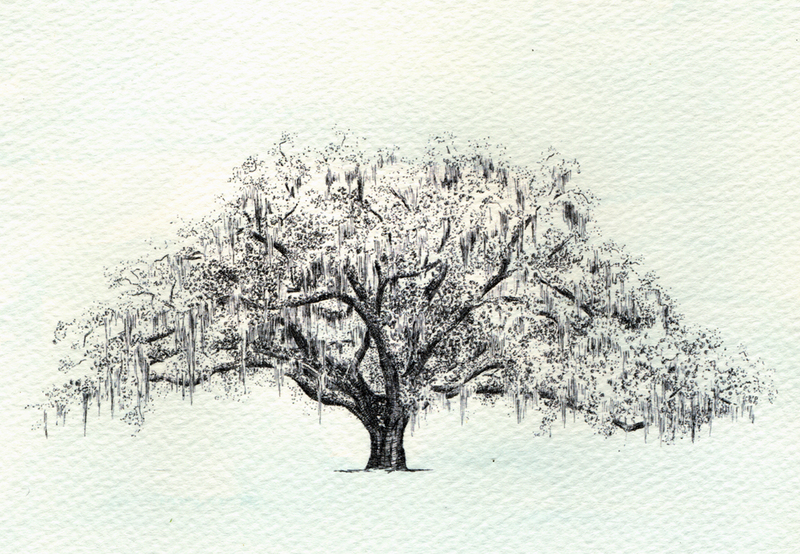 I’m so excited to finally have the Live Oak Tree Prints for sale. They’re available in three different treatments, Icy Blue and Moss Green hand watercolored prints, and archival black prints on Natural paper. All are hand-signed, and though they are listed at 5×7 inches, I can certainly print 8×10’s or even 11×14’s should you fancy a larger size. I welcome your comments, and I’m still tree huntin’ so if you know of a spectacular oak, do tell! I’m not 100% sure where I’m going with this series, other than it’s in my blood to draw Live Oaks at the moment. Sometimes it’s best not to force an idea…let the drawing hand do the thinkin’. 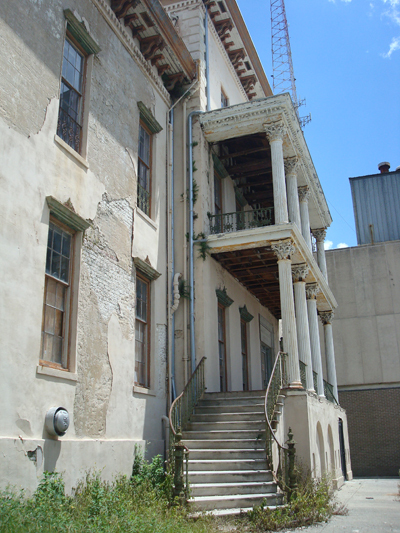 The years have been far better to the tree than to the structure for which it was named.